As our island grows and changes so does our annual party calendar. This year there is so much going on that a New Years Eve Party Crawl is looking like a good option. A few places are offering delicious dinners as well to help you start the night right and be well fortified to continue on at all the bar parties well into the first day of 2018. Rather than start with dinners and end with parties, this post is split up by North, South, and Town. Of course being in or near town at midnight is a favored choice if you want to see the fireworks display up close. San Pedro Town Council always goes all out on their fireworks displays. Last year they even had a beach component as well as the regular barge that was action packed with a stunning show. You will be able to see them from afar too depending on where you chose to be at midnight. I have also listed one Pre NYE party at the bottom as it is a good one to help you gear up for 2018 looking fabulous and fresh. 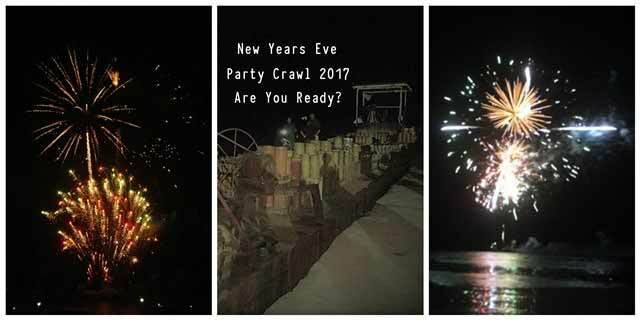 If you want to be a bit adventurous and have wheels, the following list will help you plan your personal party crawl, a super fun way to say farewell 2017 and celebrate the arrival of 2018 on Ambergris Caye. Awwwwww.... Thank you for the mention Tacogirl..... Happy New Year to everyone!